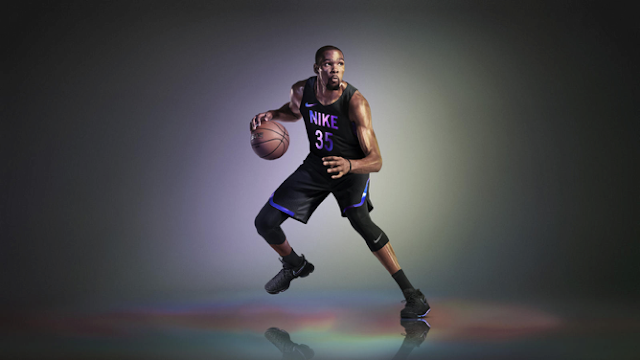 Pioneering Nike Vapor basketball uniforms impose a new order on the court by pairing progressive knit jerseys and shorts featuring Nike AeroSwift technology with innovative base layers to minimize game-time distractions and maximize performance. The system is anchored by basketball-specific base layer options, including arm sleeves, padded compression gear and knee sleeves, which together wick sweat from the skin, providing a feeling of protection and compression, and keeping the players’ arms and legs warm off-court. Designed to interact with the base layer but not cling, the lightweight, tailored jersey features stretch knit with engineered mesh as determined by extensive sweat-mapping studies. The short also introduces a FlyVent waistband that addresses the discomfort of traditional basketball waistbands via a new manufacturing process that combines two types of knit mesh into one highly secure, breathable band. This is matched to a hybrid of engineered knit mesh in the back and a hydrophobic four-way stretch woven fabric in the front. Additionally, the front of the shorts features a mobility vent. Placed specifically where basketball players need it most, based on their five key movements, it reveals a flash of tights as athletes move. The result is a 35% more breathable kit than that worn in 2012. Moving down the body, designers further reduced distraction with the Nike Elite Versatility basketball sock. A 360-degree ankle-support system, dynamic arch compression, anatomical design and footpad cushioning add to the comfort and locked-in feel of the sock, while Dri-FIT fabric wicks away moisture and increases breathability. Nike Vapor uniforms with AeroSwift technology have been partially constructed from recycled polyester, which is rendered from plastic bottles to produce fine yarn. Since 2010, more than three billion plastic bottles have been diverted from landfills and converted into recycled polyester for Nike performance products.